Love sports?? Love management?? Samvad brings you an amazing amalgamation of both! Who doesn’t love sports? Especially in India, where cricket is followed like a religion, and we find small children playing the game in every tiny lane in the country. Like every other field, even the field of sports requires effective management for smooth and hassle-free functioning. 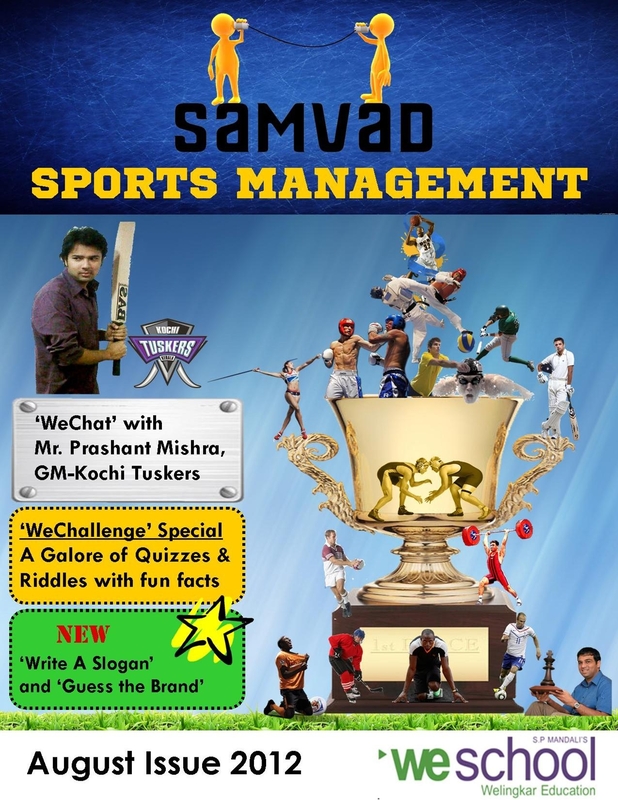 Samvad’s August issue presents to you, the latest insights into the relatively new and unexplored field of Sports Management. With the 2012-14 batches joining in, the Samvad family has grown in size. Samvad has always believed in constant innovation and with the fresh and enthusiastic talent, we are hoping to add many more fun elements to Samvad from this issue onwards, making it even more visually appealing and entertaining. We are overwhelmed by the enthusiastic response to the WeSchool Intra-college crossword quiz that we created for the last month’s issue, and plan to conduct similar fun activities with the future issues too. Our writers have contributed a variety of articles related to Sports Management in the fields of Marketing, Human Resources, Operations and Finance. Our 7th issue features a wide range of articles like ‘Role Of I.T. 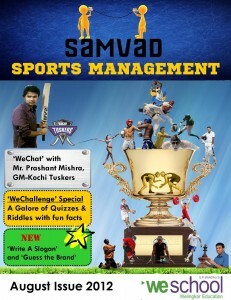 in Sports Management’ , ‘Harnessing the Thunderbolt’, ‘Sports Marketing’, ‘Corporate HR and Sports Management’ and so on. The highlight of our August issue is a one on one interview with the manager of the IPL team ‘Kochi Tuskers Kerala’, Mr.Prashant Mishra. We are hoping that it would be an enriching and enjoyable read for all. We love your enthusiasm. Keep reading and keep writing in to us. Please send in your entries to samvad.we@gmail.com. Also do visit our Facebook page: Samvad: WeSchool Student Magazine, and Fb Samvad Group. We have also introduced a Twitter handle: @Samvad_We. Do drop in with your feedback and comments. We would like to thank all the readers for their contribution and support. Click here to read the August Issue. Click here to download the August Issue.